TOKYO (AFP) - The world may be facing its most dangerous nuclear crisis since the end of the Cold War but US President Donald Trump's trip to Japan will be remembered for the lighter moments as much as for the high-level diplomacy. The setting was the idyllic surroundings of the imperial palace in Tokyo. Not a sound could be heard except the chirping of the birds and the whirring of the Secret Service helicopters. 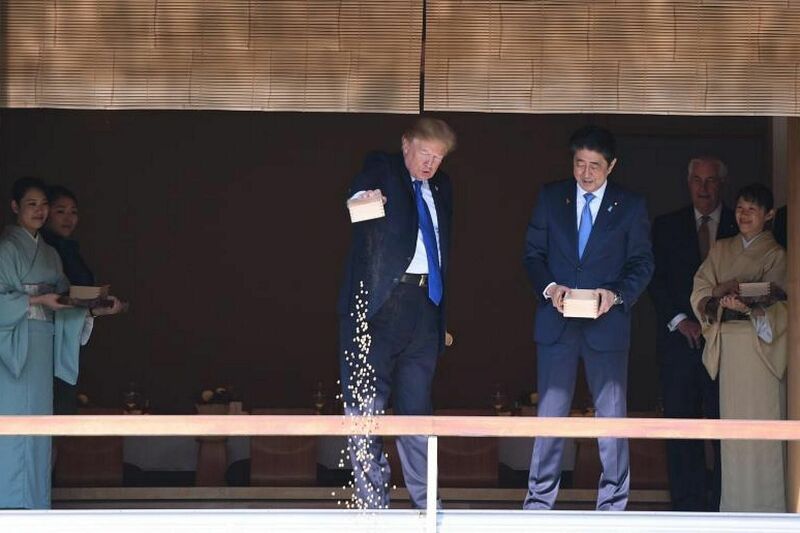 As a relaxing diversion to the high-level diplomacy, Japanese Prime Minister Shinzo Abe suggested feeding the highly prized koi carp in the imperial pond and an aide clapped loudly to bring the valuable fish to the surface. Initially, the two leaders used a spoon to sprinkle the feed on the pond's surface but the pace was apparently too slow for the US leader. On a tight schedule, Trump decided to speed things up and dumped the remaining contents of his wooden box into the pond. The picture sparked a feeding frenzy on Twitter, with uncharitable users chiding the commander-in-chief for his technique, pointing out that fish cannot absorb such a large amount of food in one go. Trump's actions also caused some mirth, with both Abe and Secretary of State Rex Tillerson apparently giggling at the sight. Forget the trade deficit, the real question is: What was the score when the two leaders faced off on the golf course? 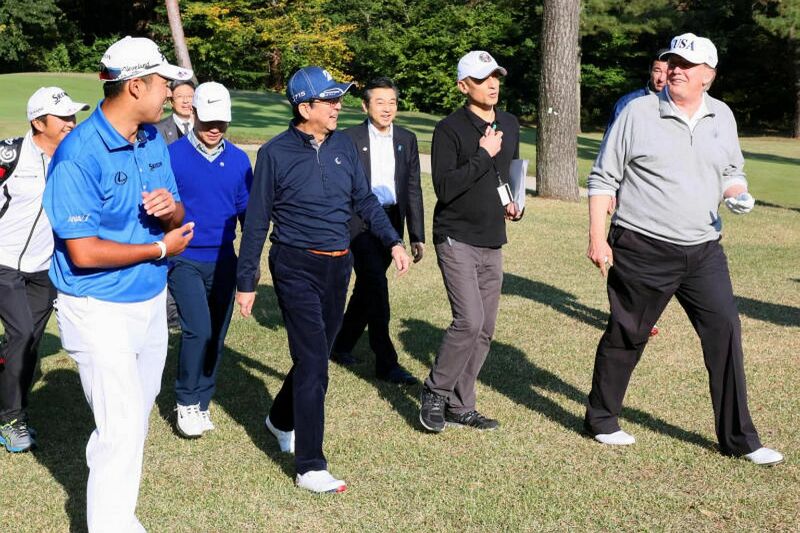 Trump and Abe wasted little time in getting down to their favourite pastime and the US leader was on tee within a few hours of touching down in Tokyo. He joked on the plane with travelling reporters, warning them it would be a case of fake news if he claimed to have out-driven their professional playing partner, world No. 4 Hideki Matsuyama. In the past, Abe has been at pains to stress that his golf skills are not on a par with Trump's, but he had reportedly been getting in some practice and maybe this paid off. "The match was a neck-and-neck competition, in my opinion. What was the reality? I hope that Mr Trump will give his evaluation," Abe said at the post-match press conference. Trump was silent on the issue but a White House spokesman had previously said that he believed they did not keep score. The way to Donald Trump's heart appears to be through his stomach and the Japanese protocol team apparently thought long and hard about what to feed him. His first meal was certainly a home comfort: a massively stacked burger made with US beef - possibly as a cue for Abe to discuss trade policy. No detail was left to chance and the Japanese made sure there was a large bottle of ketchup available for the president, who is known to douse his food in it. Dinner was surf and turf Japanese style, with steak served beside scallops from the waters off Hokkaido, over which North Korean missiles have been flying recently. Trump was visibly pumped up for his first stop on the tour, speaking to whooping US service personnel at the Yokota Air Base. 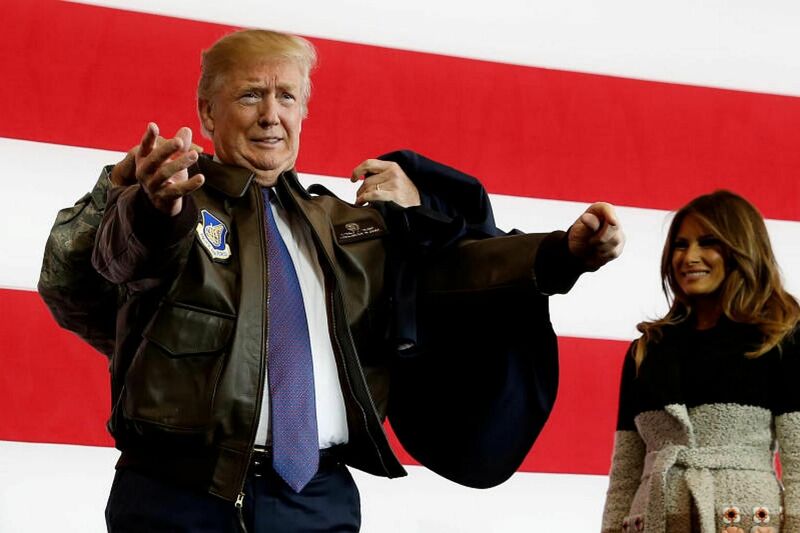 He donned a bomber jacket and said there was "nowhere" he would rather be than with the people serving their country. At one stage, one of the military present shouted out an inaudible remark that made the commander-in-chief pause. "What's your rank?" he cried out. On hearing the answer, he shouted: "We're going to raise it", to huge cheers from the heckler's buddies. It is unclear whether the heckler has in fact been promoted. One of the biggest potential pitfalls on a trip rich in protocol and diplomatic traps was a meeting with the emperor. All eyes were on Trump to see how he would greet the diminutive emperor. Barack Obama had offended US conservatives by performing an almost 90-degree bow, sparking accusations of kow-towing to the son of the wartime emperor Hirohito. Trump trod a middle path, giving the emperor a definite nod but not prostrating himself. 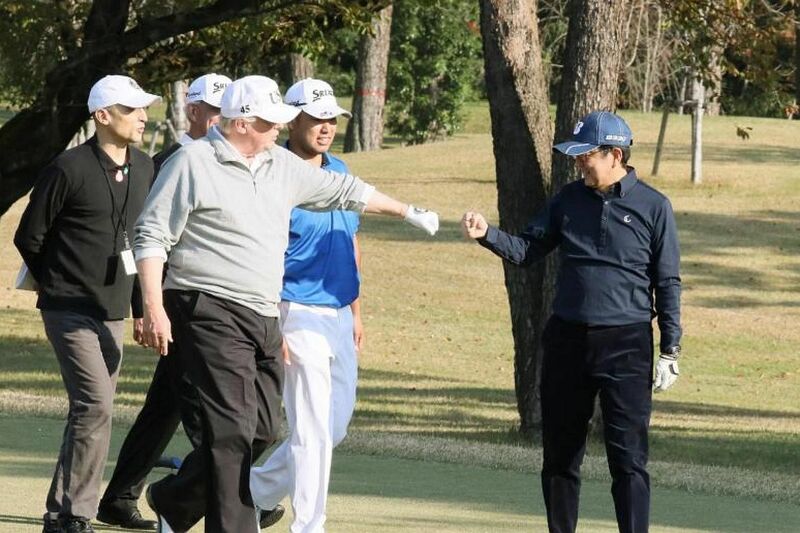 He seemed happier with the protocol on the golf course, with pictures emerging of him fist-bumping his "good friend" Abe.